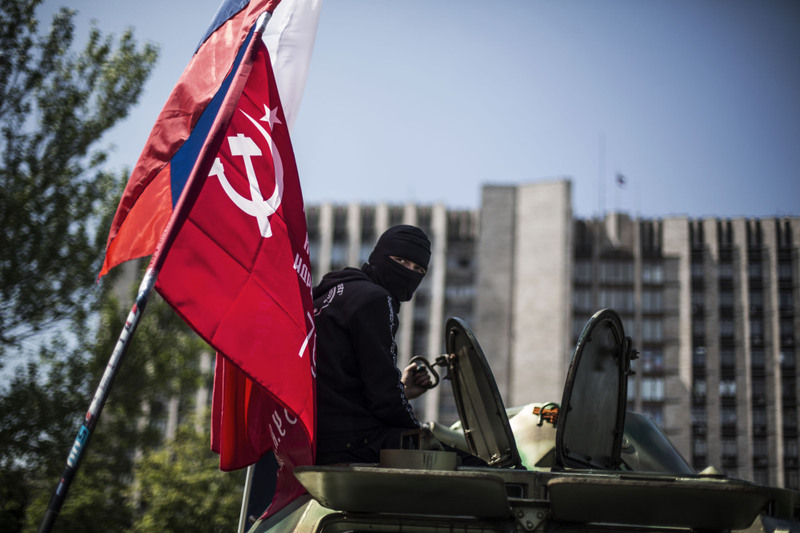 Sunday’s ballots seek approval for declaring so-called sovereign people’s republics in the Donetsk and Luhansk regions. MARIUPOL, Ukraine — As two of the most tense regions in eastern Ukraine prepare to vote on declaring sovereignty, the country’s acting president is warning them against self-destruction. Sunday’s ballots seek approval for declaring so-called sovereign people’s republics in the Donetsk and Luhansk regions, where pro-Russia insurgents have seized government buildings and clashed with police and Ukrainian troops. At least seven people died Friday in clashes in the city of Mariupol. The city remained on edge Saturday, with barricades of tires blocking some streets in the city center. The referendums are being conducted by the insurgent movements and are not regarded as legitimate by Kiev or the West. The elections chief of the insurgents in Donetsk, Roman Lyagin, was quoted by news agencies as saying early voting in Mariupol and one other district had begun early because of rising tensions there. “This is a step into the abyss for the regions,” he said. The hastily arranged referendums are similar to the March referendum in Crimea that approved secession from Ukraine. Crimea was formally annexed by Russia days later. But organizers of the eastern vote have said that only later will a decision be made on whether they would use their nominal sovereignty to seek full independence, absorption by Russia or to stay part of Ukraine but with expanded power for the regions. Turchynov and Ukraine’s interim government came to power in February following the ouster of Russia-friendly president Viktor Yanukovych after months of protests in Kiev. Moscow and many in Ukraine’s east denounce the government as a nationalist junta and allege that it intends to trample on the rights of eastern Ukraine’s Russian-speakers. More than 30 people have been reported killed as Ukrainian forces mount offensives to retake some eastern cities now under the effective control of insurgents. In the remarks issued Saturday, Turchynov said the government was willing to negotiate with representatives of the east, but not with anyone he called “terrorists whose task is the destruction of the country, a task put forth by their masters.” Kiev claims Russia is fomenting or directing the unrest in the east, with the goal either of destabilizing Ukraine or finding a pretext for invasion. During the unrest, insurgents have seized or detained journalists, activists and others including seven foreign military observers for the Organization for Security and Cooperation in Europe who were held for more than a week. On Saturday, the Ukrainian Red Cross said one of its workers and eight volunteers were held in Donetsk for several hours before being released.